TICKS – The complete life cycle of a typical tick lasts from 47 to 122 days. 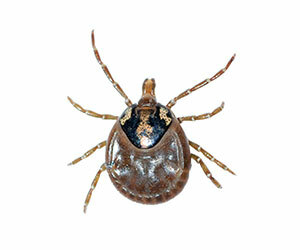 Ticks pass through four developmental stages during this cycle: (1) egg (2) larva (3) nymph, and (4) adult. Dogs pick up ticks from infested areas and carry them into your house where the tick may drop off, lay eggs, and begin a new generation. The tick has to have a blood meal from its host in order to reproduce. Some species of ticks can lay up to 5000 eggs during its life. The most common ticks found in Oklahoma are the brown dog tick, and the American dog tick. Both of these can carry disease that can be dangerous to humans. Because we treat the entire floor area, including under beds and furniture, We stress to vacuum all floors and furniture, strip bed sheets and laundry, pick up all items from floor and closets if possible. Discard vacuum bag outside, leave vacuum out for treatment. Plan to be gone for a couple of hours, all pets should be gone during and after treatment for a couple of hours.